In the current issue of In Touch Weekly they have exclusive photos and interviews and the behind the scenes story of how ‘Two Marriages are Destroyed.” The two marriages in question are the Smiths and the Lopez/Anothonys. Yesterday news broke that Jada Pinkett Smith and Will Smith were divorcing but the couple denied the rumors. 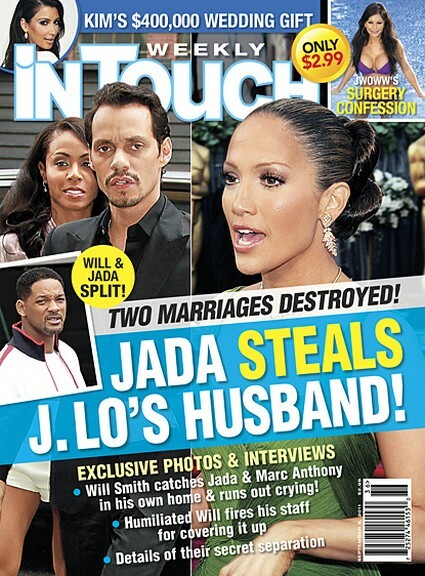 Today In touch is claiming Jada Pinkett stole Jennifer Lopez’s husband Marc Anthony. It is horrible for the magazine to come up with rumors like this. There are children involved who will be hurt by these rumors. Tabloids today will go to any lengths to sell a story!